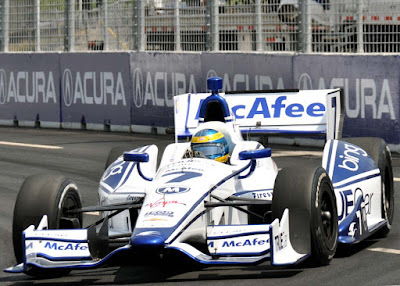 Updates: Ready to Race Thursday and Fan Friday at Honda Indy Toronto. The Roar by the Lakeshore starts with free Fan Friday, sponsored by Ontario Honda Dealers, in support of Make-A-Wish Canada - donations by fans will be matched by Honda. "Honda Fan Friday will feature a jam-packed schedule of on-track action, and off-track stunt shows, contests, autograph sessions and all kinds of entertainment in full gear from gate open to close across the event site, providing something for everyone, race fan or not!" You can even text 'DREAM' to 41010 to donate $5 by phone to Make-A-Wish! Honda Canada is a sponsor of James Hinchcliffe, Canada's sole representative in the IndyCar series, and as James is still out of competition after suffering a major crash at the Indy 500, fans can donate a minimum of $2 to the Make-A-Wish foundation to sign a 'Get Well Hinch' card at the race. James Hinchcliffe has been named by Charlie Johnstone, President of Honda Indy Toronto, as the Grand Marshal of the 2015 Verizon IndyCar Series race this weekend. "I’m looking forward to being back home in Canada and attending the Honda Indy Toronto with Schmidt Peterson Motorsports this weekend," said Hinchcliffe. "It will be a strange feeling for me not lining up on the grid this year, but being the Grand Marshal is a role I’m honoured to fulfil and I’m excited that I’ll play a role in the proceedings on Sunday." "Fan Friday gets bigger and better at Honda World every year with track-side fun and games for the whole family including free popcorn, snow cones and candy floss, golf practice swing and hockey slap shot zone, face painting, racing simulators and an opportunity to have your photo taken in a real Indy car. With no reserved seating on Fan Friday, attendees will have access to all grandstand sections on a first-come/first-served basis." 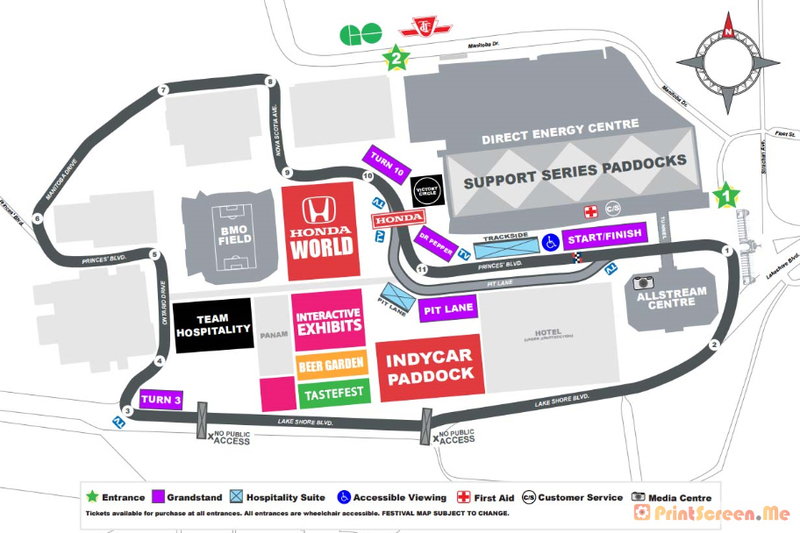 The IndyCar Paddock is in the centre of the track along with the Beer Garden, TasteFest and the Interactive Exhibits. Across the Road is Honda World. 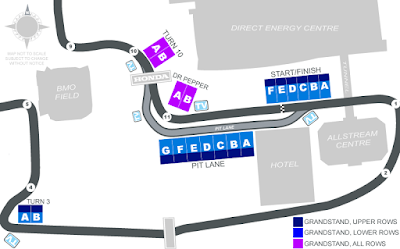 On the outside of the track is Winners Circle by the pedestrian bridge near Turn 10 while the support series paddocks are in the Direct Energy Centre. Grandstands are located at the Start/Finish Line, Turn 3, Turn 10 and Turn 11 (Dr Pepper). Hospitality Suits are located at Trackside along the outside of Pit Lane and near the entrance to Pit Lane. You can see some of the course construction on my blog post here. Exhibition Place provides the temporary home for the Verizon IndyCar 2.84km, 11-turn street course that is set up every year, anchored with Thunder Alley which runs along Lake Shore Boulevard West. Entrance to the site is limited to the GO Transit Train Station, the TTC streetcar stop and the main entrance off of Strachan Avenue. The pedestrian bridges over Lake Shore won't be accessible this year. Parking and travel in the area with Lake Shore Boulevard blocked off for the race is difficult so try to take public transit if possible. Gates open at 8:00 am daily. Notice from the City of Toronto for the proposed Honda Indy Weekend road closures: Strachan Avenue between Lake Shore Boulevard and Fleet Street will be closed on Wednesday, June 10 starting at noon. Later that day, starting at 9 p.m., Lake Shore Boulevard from Strachan Avenue to British Columbia Drive will be closed. Both road closures will be in effect until Sunday, June 14 at midnight. There will be no eastbound or westbound traffic on Lake Shore Boulevard during these closures. The only available access to Ontario Place will be from Lake Shore Boulevard at the foot of Strachan Avenue. On Wednesday, June 10 Honda Indy Toronto and William Ashley will unveil the custom-designed crystal trophies by Waterford Crystal and William Ashley. The awards will be given for the winners of the Verizon IndyCar Series and Indy Lights races. Charlie Johnstone of Honda Indy Toronto will join IndyCar driver Stefano Coletti of the KV Racing Technology car and Jackie Chiesa, President of William Ashley, during the presentation which starts at 1:30pm at the William Ashley Bloor Street West location in Toronto. Canadian rock band The Trews will be singing the Canadian and United States national anthems during the opening ceremony on Sunday, June 14. The band has had 16 top 10 Canadian singles since releasing their first album, House of Ill Fame, in 2003. “The Trews are a great representation of Canadian musical achievement,” said Charlie Johnstone, President of the Honda Indy Toronto. “Having a band that's from our own backyard performing the national anthems is a really symbolic way to kick-off the race." The 2015 Honda Indy Toronto motorsport festival begins Friday, June 12 and continues till the big race on Sunday, June 14, 2015. The Verizon IndyCar Series Pre-race celebration starts Sunday at 2:45pm with the green flag starting the race at 3:37pm. Muzik Beach Paradise Island in Exhibition Place hosts the Official Driver's Party on Friday, June 12 with race fans 19+ invited to purchase tickets and join the drivers for a night of entertainment with some of the best racers in the world. “We are excited to team up with Muzik again for the official drivers’ party,” said Charlie Johnstone, President of the Honda Indy Toronto. “The venue is located by Turn 6 and overlooks the track, making it the perfect place for people to feel close to the action.” The night starts at 7:30pm with a VIP red carpet event, followed by a Question and Answer Session at 8:00pm. Major sponsors include Molson Coors - returning again since their sponsorship from 1986 to 2006, Cooper Tire and Rubber Company - providing an interactive fan zone, Dr Pepper and the Toronto Star. "We are so excited to be back once again with this awesome motorsport event. Molson Coors has a long history of supporting community events across Canada and we are very proud to be part of the Honda Indy Toronto excitement again!" said Greg Barbour, Senior Director of Sponsorship and Events, Molson Coors Canada. "Our brands have grown hand in glove with the most important sports events in this country and we look forward to joining Honda Indy Toronto fans to celebrate. 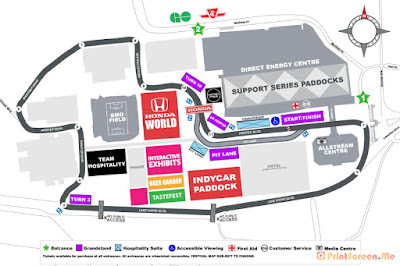 In 2015, the Honda Indy Toronto will feature a full-site license and a central beer garden located near food vendors and interactive games. Individual vendors selling beverages will also roam the grounds." 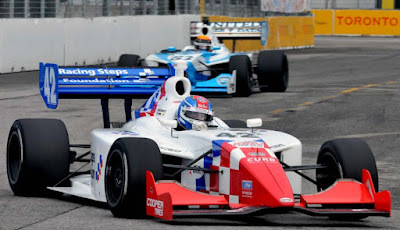 "Cooper has deep roots in racing and we are thrilled to welcome them as a partner for our event," said Charlie Johnstone, President, Honda Indy Toronto. 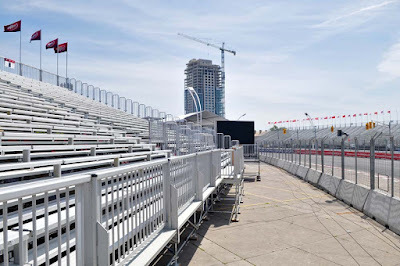 "Their commitment to motorsports is one that we share and their presence onsite will be a great area of engagement for race fans during the Honda Indy Toronto weekend. As part of its consumer activation on site, Cooper will host a fan spot that features interactive exhibits, games and activities, as well as special guest appearances and autograph sessions." Honda Indy Toronto has confirmed that there will still be Grid Girls. Muzik will pick the ladies who will identify the drivers for the race. Seven Race Series will feature 13 races over the weekend: Robby Gordon's SPEED Energy Formula Off-Road, the exotic cars of the Porsche GT3 Cup Challenge Canada, Indy Lights by Cooper Tires, Pro Mazda Championship by Cooper Tires, Mazda Road to Indy in the Cooper Tires USF2000 Championship, the Canadian Touring Car Championship (CTCC) presented by Continental Tire and the Verizon IndyCar Series. See the race schedule after the jump. 3:30pm Drivers' Start Your Engines!